This photocopy transfer shows a four-leaf clover as an organic Venn diagram. Finding the love of your life can feel like finding a four-leaf clover. 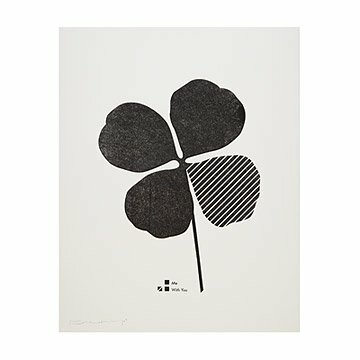 This print by Gregory Beauchamp renders that rare good luck charm as an organic Venn diagram through photocopy transfer: An image is layered face down on the printmaking paper, and then a citrus solvent and patient hand-burnishing transfers the copy to the final print. More impressionistic than a screenprint, this method celebrates the subtle variations characteristic of a hand-printed image. The key at the bottom of the image is a subtle nod to being lucky in love. Handmade in California. "The world is full of happy little moments to happen upon," reflects printmaker Gregory Beauchamp. "The chance you're surrounded by them is enormous." He lives in Venice, California where the two things he loves the most are a girl named Jenny and a cat named Motley. He believes that the simpler you can make something, the more universal it becomes, that creativity can solve anything, and that we can make tomorrow better than today, for everyone. I found out I was Irish from an ancestry test my husband bought for my birthday, this gift is a perfect response for our 1 year paper anniversary. Perfect print...quality paper....unique, but simple! Just what I was looking for! This print is awesomely clever. It is extremely unique, which makes it a very thoughtful gift. My husband immediately asked where I found such a cool gift! Bought for my one year anniversary. Just lovely, would recommend! going up in a frame to decorate our house.